With an interesting decision issued on June 14, 2017, the EU Court of Justice basically declared that the commercial denomination of vegetarian or vegan products cannot contain words such as “milk”, “butter”, cheese”, etc.. The case brought before the Court concerned a German Company specialized in the production and sale of purely-vegetable/vegan products named “tofu butter”, “vegetable cheese”, “cream” etc..
A German association engaged against unfair competition practices (“VSW”) challenged those product denominations on the grounds that they were in breach of anti-unfair competition provisions – thus unfairly damaging the interests of dairy industry operators. The German Company – on the other hand – claimed that (i) consumer – since some time – already developed a new way to perceive terms such as “butter”, “cheese”, “milk”, etc..; on the other hand (ii) those terms are always used jointly with adjectives such as “vegetal”, “tofu”, “rice” which therefore avoid any risk for misleading consumers as to the origin/nature of the involved product. Exceptions for the use of “milk” and other dairy products regulated terms beyond of the scope provided by EU regulations are – themselves – strictly regulated by certain other EU regulations. These exceptions are strictly limited to (i) products in which other ingredients have been added to the milk (without replacing it), or (ii) products whose denominations are nowadays considered as traditionally acquired (and included in a specific, detailed positive list). It seems to us that a decisive element for the Court was the existence – in the EU legal system – of specific regulation of those exceptions (and in particular the existence of a positive list) allowing the use of “milk” and other dairy products within the denomination of products which do not contain those ingredients. In its final considerations, the Court holds that the provisions defining scope of terms such as “milk” and other dairy products are aimed at (i) improving the economic conditions of dairy producers and traders, (ii) improving dairy products quality, (iii) protecting consumers and (iv) fostering fair competition. Strict application of those definition are considered by the Court as necessary elements to achieve those goals. We wonder how in theory a similar case would be treated under PRC system. There shall appear on the label – either before or after the name of the food – such additional words or phrases as necessary to avoid misleading or confusing the consumer in regard to the true nature, physical condition of the food, or method of preparation of the food. Each of those standards provides clear definitions for that specific product as well identifies and defines sub-categories; needless to say, those definitions are strictly referred to “real” dairy products, not including their “vegetable version”. Prima facie this leads to consider not compliant a product labeled as “vegetarian duck”, “vegetarian chicken” etc.. – rather common, not only in vegetarian restaurants, but also on ecommerce mainstream platforms (on the other hand, no such an issue for “soy milk”, “coconut milk” as Chinese language does not use the term “milk” for those). 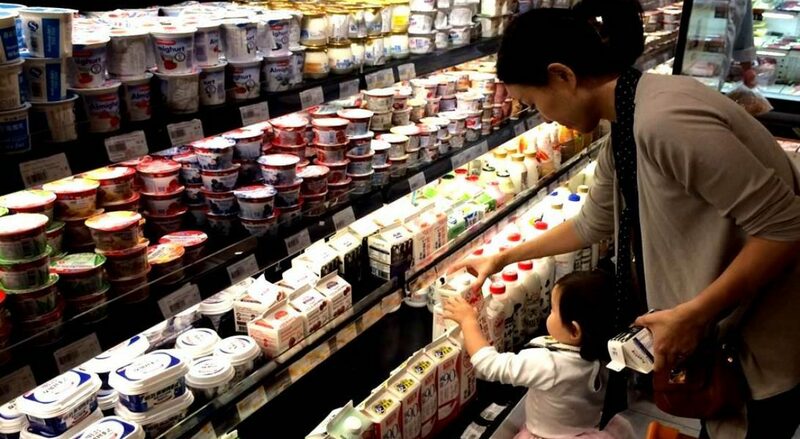 Compared with EU system, Chinese system – as of today – does not include specific provisions defining scope, limits and requirements for any figurative or exceptional use of “milk”, “cheese”, and dairy or meat products denomination. This means that either any such “out-of-boundaries” use is totally forbidden, or that it is allowed as long as it can be considered as a “common or usual name which is not misleading or confusing to the consumer” – however in such second case, it can be used only in the absence of an official/legal denomination for that product, or in addition to the official/legal denomination. For instance, “vegetarian meat” is not a legal definition: usually these kinds of product fall under the scope of GB/T 23494 (Dried tofu) or SB/T 10649 (Soy protein products). It could be argued that while the former provides a clear definition of the product (“dried tofu”), the second mainly identifies a general category of products (rather than specific name). As a consequence, it could be deemed that for dried tofu any use of other names (such as “vegetarian meat”) might conflict with GB 7718, while soy bean protein products might still be eligible for a more descriptive name. Moreover, and in the need this might be the most relevant element beside any other legal analysis, we are talking about products which are very familiar to Chinese consumers: not only tofu is a staple of Buddhist cuisine, and so are other soy protein products; but also denominations such as “vegetable chicken” and similar have a generations-long tradition in China. Maybe – for the same reason – a term such as “vegetarian cheese” might be less solid, but it could be also argued in a way that “vegetarian meat” has already cleared custom for other “vegetarian animal-products”. In the end, it seems to us that (i) as long as a certain notoriety of the “vegetable” term can be proven, (ii) in the absence of specific legal limits to the exceptions for use of food legal denominations, (iii) if due precautions are taken to avoid misleading or confuse consumers about the true nature, physical condition of the food, or method of preparation of the food, Chinese system might have a less rigid approach to the “vegetable” food denominations.